Sony Corp (6758 JP) is forming a bullish descending wedge/channel that once mature will chisel out an intermediate low with scope to clear medium term breakout resistance. The tactical low near 4,400 lies just above more strategic support. Clear pivot points will help manage positioning within the bull wedge that is in the final innings. The tactical buy level is not that far from strategic support with a more bullish macro lean. MACD bull divergence is not only supportive into near term weakness but also points to a breakout above medium resistance. Risk lies with Sony not looking back after hitting our tactical low target. Ftse China A50 Index (XIN9I INDEX) has been our top long bet in Asia from early January (10,800), outperforming both the HSCEI and HSI. Key chart points that suggest the A share rise will be getting ahead of itself after the next rally phase out of bullish triangulation. Once this breakout terminates we see evidence of a harder decline unfolding ahead of a trade deal. This window allows for a pullback ahead of a trade deal spike that will put in place a key cycle peak just under shanghai composite resistance that goes back to highs from 2009, 2016 and 2018. Keep in mind that China’s cycle exhibits a series of rally and fade cycles that form a multi-year basing process. The Shanghai composite longer term chart outlined rally and basing cycle correlations. We view weakness in global equity markets over the past week as correcting a significant amount of the excess optimism. We recommend taking advantage of the pullback by adding exposure to our favorite areas – namely Technology. Our overall outlook on global equities (both the MSCI ACWI and ACWI ex-US) remains positive and we continue to expect higher equity prices going forward. In today’s report we provide a technical appraisal of all major markets and highlight actionable stocks throughout the int’l Technology and Communications sectors. Market activity, both bonds and stocks, has been all about realigning expectations. Wednesday’s Fed announcement was more dovish than expected, and the market is now pricing in roughly 25bps of cuts by the end of 2019. Stocks reacted positively on Thursday, but then reversed (and then some) on Friday as global growth concerns became a little more serious. We continue to maintain our positive outlook. In today’s report we recap our bullish investment thesis and highlight attractive Groups and stocks within Consumer Staples, Materials, and Services. 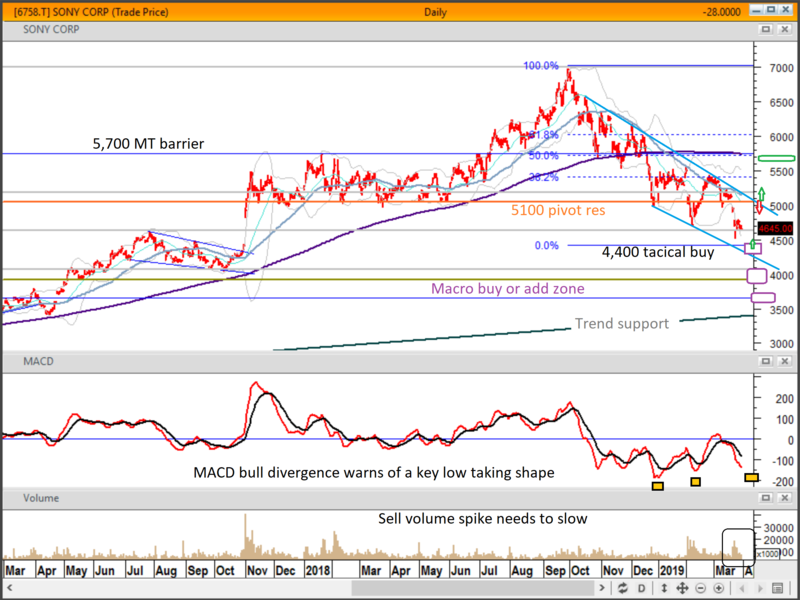 Golden Agri Resources (GGR SP) has started a basing process below pivot support at 0.30 as the daily MACD cycle has not been confirming recent lows for a case of underlying supportive bull divergence (sell pressure dwindling as downside momentum tapers off). Bull divergence outlined in the MACD is supportive on a macro basis, however there is downside risk stemming from the micro rising wedge. A fresh diverging low is expected to market a price low to work into. Immediate inflection levels at 0.30 and 0.26 will dictate near term direction out of the micro rising wedge. Ideal downside projections are noted along with a bullish resistance threshold.